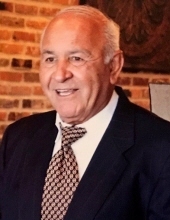 Nick Crechale, 66, of Purvis, passed away Wednesday, January 16, 2019 at Select Specialty Hospital in Gulfport. Funeral services will be at 11:30 a.m. Wednesday, January 23, 2019 at The Barn at Bridlewood with a private interment in the Crechale Family Cemetery to follow. Nick moved from Greece to the United States when he was a young man. With no resources, through hard work and determination and years of experience, he became a multi-faceted entrepreneur. Some of his more notable careers included: restauranteur, auto dealer, real estate mogul, and property developer. Nick truly lived life to the fullest and if he dreamed it, he achieved it. Even while managing his many beloved projects, Nick could often be found riding his horses or enjoying his boat with his family and friends. He often returned to his home in Greece to visit family. There was no greater host than Nick. Anyone he met was a friend and felt welcome anywhere he was. His smile was infectious, and he will be remembered for his intense love of life, family, and friends. He is survived by his wife, Athena Crechale of Purvis; three sons, Johnny (Frankie) Crechale of Hattiesburg, Alex (Jessica) Crechale of Purvis, Paul (Sara Beth) Crechale of Purvis; a daughter, Elizabeth Crechale of Purvis; a sister, Amelia Makaratzi of Greece; seven grandchildren, Alexander Grissett, Kace Crechale, Nicholas Crechale, John Paul Crechale, Alaina Crechale, Gage Jacobs, and Parker Cameron. He is preceded in death by his parents, John Nicholas and Elizabeth Volotis Kristsalos. Visitation for Nick will be 5 p.m. until 9 p.m. Tuesday, January 22, 2019 at the Hattiesburg Chapel of Moore Funeral Home and 10 a.m. until service time at The Barn at Bridlewood on Wednesday, January 23, 2019. To send flowers or a remembrance gift to the family of Nick Crechale, please visit our Tribute Store. "Email Address" would like to share the life celebration of Nick Crechale. Click on the "link" to go to share a favorite memory or leave a condolence message for the family.